Have Everything? How About a Final Ride in a Jaguar Hearse? Sadly, the original Jaguar hearse was destroyed during the filming of the movie in 1971. But there’s a recreation of this cinematic hearse that would make a memorable sendoff for those who want to make a big impression with a small vehicle. 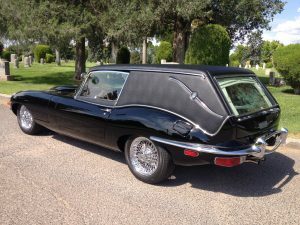 Ken Roberts, an Arizona-based car enthusiast, began work to recreate the original Jaguar hearse from Harold and Maude beginning in 2013. “I was a friend of George Barris for 13 years,” Roberts explained. Barris, known as “The King of The Kustomizers,” created memorable vehicles for motion pictures and television series, including the original Batman television series, The Munsters, The Beverly Hillbillies, and Nightrider. That launched a search for a 1971 Jaguar convertible roadster that was featured in the film as the gift Harold’s mother proudly presents with a big red bow on top. This specific car was found and purchased from the private collection of a Las Vegas Jaguar dealer. They carefully examined 35 still frames from Harold and Maude, studying the automobile’s images with a magnifying glass to find out exactly how the vehicle in the film was built, to determine the precise details of the parts. It took 40 months to build out the vehicle, with some false starts and a few problems. The back hatch opens by remote control, like a modern-day SUV. In the back, a banjo case holds items representing the fake suicides Harold would stage to upset his mother. Harold picks out a tune on the banjo at the end of the film. Only after the car was completed, Roberts had the opportunity to meet the designer/builder of the original Jaguar hearse. That’s when he discovered the back door of the vehicle didn’t open. The script didn’t call for it. Now that the vehicle is completed, Roberts is taking it to Jaguar Concours d’Elegance competitions in western U.S. states, where it is winning “Best of Show” and first place awards in its category, modified vehicles. Roberts has offered to hold celebrity pet funerals with the Jaguar hearse, for a price. Since the cargo space is too small for a full body, he figures it would work for a pet funeral. Given the popularity of cremation, he could easily carry an urn of a celebrity’s cremated remains with attention-getting style. Interested in connecting with Ken Roberts and his Jaguar hearse? Contact Don Kessler, Resources Manager of the Ken Roberts Collection, at 541-840-0240 or email dkvrod@gmail.com. Gail Rubin, CT, is a death educator who uses humor and funny films to teach about end-of-life topics. She’s the author of A GOOD GOODBYE: Funeral Planning for Those Who Don’t Plan to Die, HAIL AND FAREWELL: Cremation Ceremonies, Templates and Tips, and her latest, KICKING THE BUCKET LIST: 100 Downsizing and Organizing Things to Do Before You Die. Learn more at www.AGoodGoodbye.com.